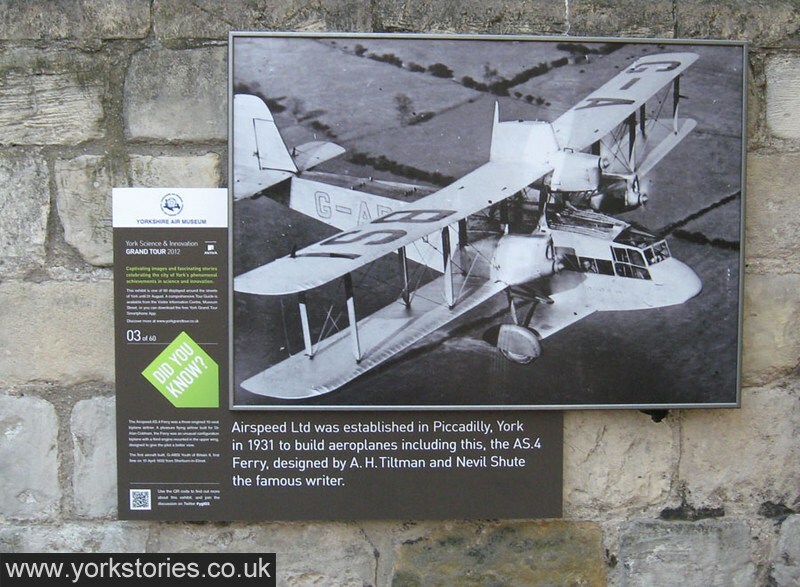 One of the panels installed on the city’s buildings as part of the York Science and Innovation Grand Tour. I’ve passed many of these in the city centre. They’re informative and impressive and introduce us to facts we probably didn’t know. On Clarence Street, I passed a panel or two noting the history and achievements of York St John’s, on its own buildings. In the Museum Gardens I passed a panel drawing our attention to the work of Tempest Anderson – close to the Tempest Anderson Hall. On Davygate I passed a panel on the wall of St Helen’s church, drawing our attention to Airspeed. Surprised to find it here. The building they occupied in Piccadilly is still there. It’s the one everyone calls a ‘bus garage’. Wonder why the panel wasn’t located on the building the text and image refers to? As at St John’s? This outdoor exhibition is billed, as these things always are, as being for both visitors and residents, though residents recognise the main focus is to attract more visitors. Presumably it isn’t thought desirable to draw the attention of visitors to an empty building in Piccadilly, though the panel encourages us to be proud of our connection to Nevil Shute and Airspeed. It would have been nice, would have given a proper ’sense of place’, if the panel had been attached to the building it describes. Which will remain, in most people’s eyes, just ‘that old bus garage in Piccadilly’.